RidesharingServices.com: You will make $35 an hour and/or $1500 weekly with Lyft, But For How Long? You will make $35 an hour and/or $1500 weekly with Lyft, But For How Long? Will I make $35 an hour driving for Lyft? Yes, you will. If you drive 50 hours per week, you will clear $1500 per week. Even though Lyft is quick to deactivate drivers, they will take care of high rated drivers who work many hours transporting riders. Once Lyft decides they need commission, they will deduct at least 20% from your weekly direct deposit. Don't get too comfortable to think that $35 an hour will arrive weekly. Always remember that deactivation is inevitable, because Lyft hasn't educated their riders on the importance of accurate ratings. Lyft has a way with recruiting and deactivating drivers. They seem to believe an endless pool of drivers are available to perform the dirty work, driving around highly intoxicated and/or late riders who need rush service. The worst part of Lyft is their riders refusing to accept maximum seating requirements. Better yet, these obnoxious riders will overseat Lyft rides and drink open containers. Lyft is quick to deactivate drivers. Deactivated drivers must coerce Lyft for an explanation to calm their nerves. "What did I do wrong" probably clouds their minds. "How can I get deactivated" for never having an conflict with any of my riders? It happens on the Lyft platform. Uneducated riders understand the power of their fingers, so they use them to rate low and write lengthy feedback to harm their drivers. Yes, there are bad apples out there that want to hurt people. They want people to suffer like them. Their poor attitudes are partially to blame for so many Lyft drivers losing their ridesharing privileges. Why cry over this overrated platform? We can't convince Lyft to change their standards, especially since they rely solely on riders to share certain feedback that equips them with flagging material. That's right folks, Lyft has a flagging protocol set into place. Once all flags are activated, including 3 Community Review flags and overall rating dips below the minimum threshold, you are done as a Lyft drivers. You won't be able to argue your way back into becoming a Lyft driver. Don't waste your time trying to get an attorney because there are no employment laws protecting you as an independent contractor - it varies state-to-state. Driving with Lyft is an independent contractor position, it is not a job where you have rights. Lyft made it clear that drivers are not employees. Their staff refuse to provide personal phone numbers and/or reply back to lenders, car dealers, apartment leasing officers and other entities requesting employment status. It won't work. Don't give a driver "1" star to make yourself feel better about your crappy day. Running late? Accept that it's your fault you are running late, not the driver who is working their tail off to drive people like you. Inform your driver that you need to reach your destination as safely as possible. Tell them that you're running late so they know to take better routes. In the morning, traffic and road construction will block the roads and create unwanted delays. Going to the airport? If you live in San Francisco , request a Lyft at least 90 minutes ahead of your departure time. Too many riders think giving out "1" stars will improve Lyft. All this does is move drivers into deactivation status. Several "1" star ratings will eventually get drivers booted from Lyft. They won't be reconsidered to drive on this ride platform again. Unless Lyft relaxed their standards, we don't see deactivated drivers getting a second chance. It won't happen. Lyft enjoys bragging about their ridesharing services on their main Facebook page to the extent in which they appear as a cult trying to brainwash the ride community into believing the Pink mustache can't do any wrong. We're sure the Lyft Marketing Team is running the Twitter handle. They act as if deactivations never happens, that all drivers are treated equally and without prejudice. Everything you do from the moment you first hit the road matters. 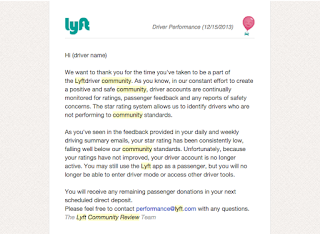 Lyft is watching your driver account for any complaints. They monitor your star ratings. In the past, a 4.79 overall rating would trigger an account deactivation. The Performance Review department relies on star ratings and feedback to make deactivation decisions. 4.6 is now the new minimum star rating. Don't think otherwise that Lyft is flexible. Want proof? Lyft will flag driver accounts for deactivation during the first weekend, week, month, few months, and/or a year later. Star ratings and feedback matter most. Lyft is infamous for deactivating drivers, ignoring customer complaints and refusing to address specific problem areas. They will send a list of 100 things to do for one problem. You'll never know what customers are saying about you. Lyft conceals all this feedback in their virtual vault. If you ever drive a horrible rider, make sure you submit the right star rating. Don't feel sorry for this tough, rude riders. We can assure you these riders plan to rate you low. It is obvious these type of riders exist at Lyft. They usually run late, blaming the driver for every delay. They request Lyft rides an hour before their flight departs. They run late to jobs, to meetings and to conferences. At pickup, these riders take their time to get ready. We hope they don't require you to fist-bump every rider, because this is one reason you probably get rated less. Most riders dislike fist-bumping, so they assume this is how you operate as a driver rather than company policy. Ready to make $35 an hour driving for Lyft? Want that $1500 a week deposited in your bank account? Ready to make a difference in your life? This can be done at Lyft! Just know that you must be prepared to wow your riders. Spoil every rider. The moment your riders tell you this is my best Lyft ride, you are performing well. But then, there comes those tough, rude riders that ruin it for everyone. 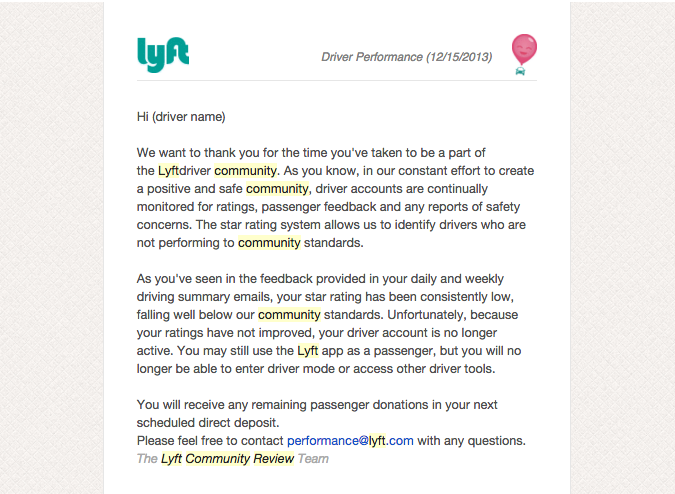 They're responsible for causing driver deactivations based on their feedback and star ratings tarnishing good drivers. You'll know when you drive one of these riders. They will rate you low just for talking to them. Anti-social riders are the worst, since they sit upfront and refuse to say a word. It gets uncomfortable for drivers to transport these riders because they don't want music, don't want to talk, complain about heat and/or A/C, and are just unhappy people. Watch out for these rider types. They represent the group who are empowered to deactivate you. Beware! Know where all open restrooms are located in your driving area. Know what time these stores, gas stations, and facilities close. If you have to go, go. You won't feel comfortable driving with a full bladder. It is the worst feeling to keep holding and driving. Your riders won't understand your pain. For the most part, you risk deteriorating your health. Don't wait to go. Holding may potentially cause chronic kidney disease, UTIs, and/or other health issues. Dehydrating yourself to avoid using the restroom may cause serious health issues. Drink plenty of fluids. Use the restroom often. Don't allow lost earnings to influence driving habits. In the end, you may lose the ridesharing game. Lyft drivers earn far more than UberX drivers. All in all, Lyft drivers don't pay commission past 50 hours, They receive tips from 60% of their riders. It would take an Uber driver 70+ hours to match a Lyft driver working 50+ hours. In our most honest opinion, Uber provides a far superior service. Most of the complaints we hear are from Lyft drivers refusing to wait for riders. These Lyft drivers pry into personal problems, telling riders how to live their lives and ridiculing them for not having children. Some drivers refuse to return personal items unless the rider pays them. Take a risk and drive with Lyft. Make that $35 per hour and/or $1500 per week driving full-time. Be careful on the road, especially in downtown San Francisco. Keep an external charger on hand in case your cigarette lighter stops working. If your phone battery dies, you can't work. Know how to deal with ridesharing app issues. Make a mental note of all the restrooms within driving area. Don't drive when tired. Take breaks. Stretch out. FYI, Lyft will eventually take commission. Have fun lyfting!